Get Qualified to Teach English: Which TEFL Course Is Best For You? Home » Travel & Adventure Advice » How to Teach English Abroad » Get Qualified to Teach English: Which TEFL Course Is Best For You? There are three main types of English teaching certifications available that you will have probably seen around the internet: CELTAs, TEFLs, and TESOLs (as well as a few other variations). If you are interested in getting qualified to teach English, you have probably asked yourself which TEFL course is right for you. I’m going to talk more on the specifics of each of these courses and make my personal recommendations in a moment, but first, take this quiz that I made to see which teaching qualification is best suited to your current needs. 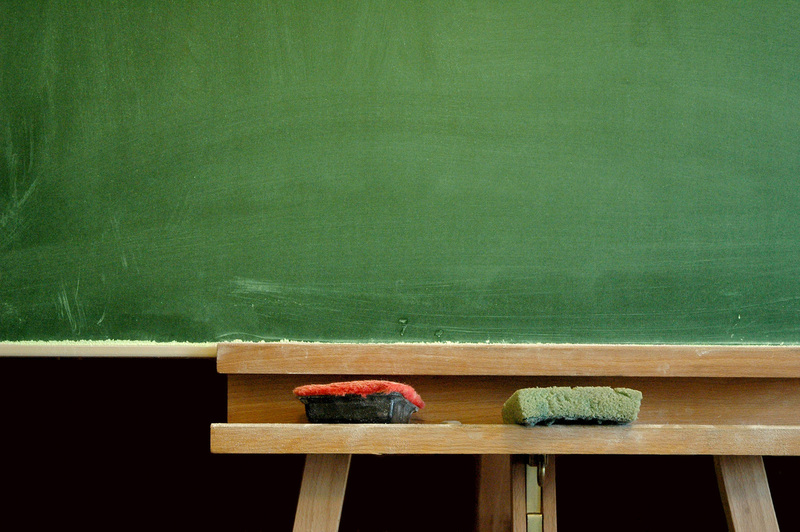 Which English Teaching Qualification Should You Do? Below is a little flow diagram I created to assess your needs in order to teach English. This is not an exact science and all of the information on this page is based upon my experiences of teaching in a few different countries and having many friends who teach English in different parts of the world. I’d now like to outline each different option, recommend some courses, and explain my recommendations. Time: 120 hours, part or full time. What is a TEFL / TESOL qualification? TEFL stands for Teaching English as a Foreign Language, referring to the industry rather than the certification, and is the most common type of teaching certification in the world. Courses can be in person, online, or a combination of the both. TESOL stands for Teaching English to Speakers of Other Languages, and it is essentially the same thing as a TEFL, but uses a different title, thus a different string of letters. You may find other variations of the letters which are also different names for the same thing. 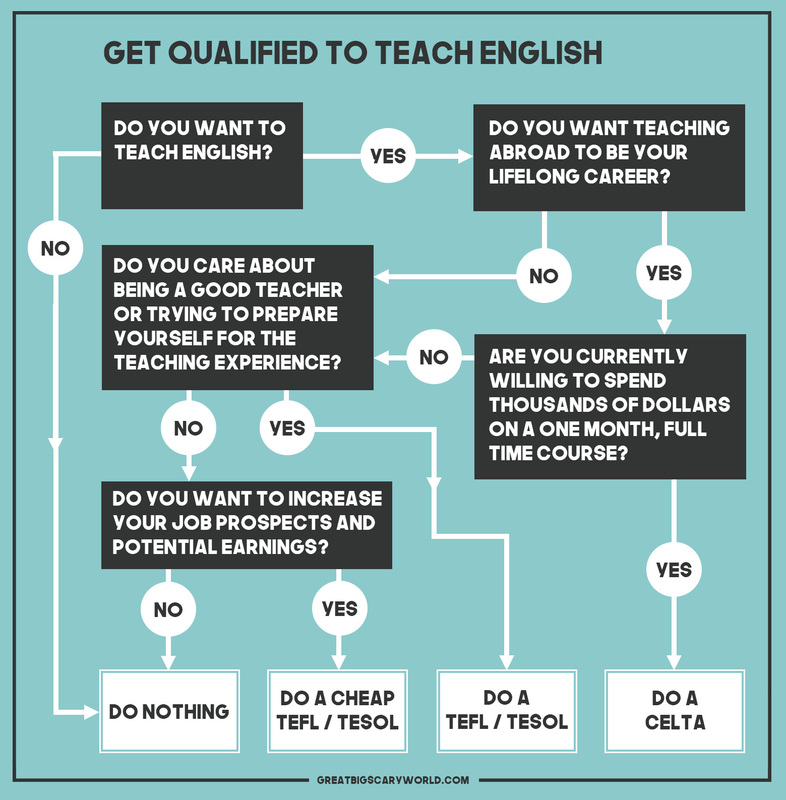 Who Should Do a TEFL / TESOL? Doing a ‘proper’ TEFL / TESOL course is for people who would like to be competent English teachers. You don’t need a TEFL / TESOL to teach, but it will dramatically improve your job prospects and make you a better teacher if you do a decent course. The minimum recommended course time is 120 hours (as anything less may not be considered valid by employers / immigration officials) and this can be done online to reduce the cost, although if you can include a classroom teaching element in your course (normally 20 hours of classroom experience which can be organised locally) it will be of a good benefit to you. When choosing a TEFL / TESOL course, it is important to consider the quality of the course that you will be doing if you care about your performance as an English teacher. Below I have included two course recommendations that offer comprehensive content and tutors to help guide you through the material and answer all your questions. 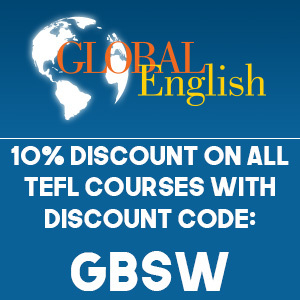 If you don’t care about the quality of the course and you simply want the cheapest course you can get, skip ahead to the ‘cheap TEFL / TESOL’ section. Time: 120 hours, part time. 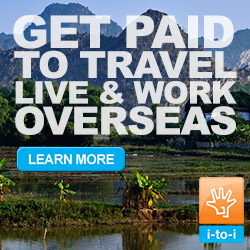 Yes, it is possible to get a 120 hour TEFL for $5 if you book it from a discount site at the right time. These ultra cheap TEFL / TESOL courses are for people who want to get a teaching qualification in order to boost their job prospects, but don’t care about the course content. I’m not casting judgement, I’m simply pointing out that when courses are priced this low it is impossible for the company to offer unlimited (if any) tutor support or decent levels of assessment, thus the quality of their courses is considerably lower and you will be getting the ‘TEFL licensed teacher’ title without a strong education to back it up. Friends who have done these courses in the past have said that the courses were not particularly complex and the level of assessment was quite simple, normally resulting in a pass. They certainly serve a purpose in the market place – allowing cheap access into the TEFL industry – but have a little read through my post titled, A Word of Warning On Cheap TEFLs, before committing to one of these courses. Cheap TEFL / TESOL Course Recommendations Coming Soon. Time: 4 weeks, full time. CELTA stands for Certificate in English Language Teaching to Adults and is an intensive form of a TEFL qualification that is authorised by Cambridge English Teaching Qualification centres all over the world. Having a CELTA is held in higher esteem than having a TEFL and is a worthwhile investment if you want to teach English for the rest of your life, but will set you back thousands of dollars, as well as a month of lost earnings as you study full time. For most jobs you don’t need a CELTA – a TEFL / TESOL is enough – but you will occasionally come across jobs that do require a higher qualification. If you don’t have teaching experience to back up the CELTA, your qualification will be higher than your experience which is why (in my past experience) people often undertake CELTA courses after they have already been teaching for a couple of years. They allow further career development and job opportunities. The cost of CELTAs varies hugely between the different countries in which you study, but an important aspect to consider is whether or not your course includes accommodation. Studying and living with your course mates for a month is a great experience for making lifelong friends, but you can save money by finding your own accommodation – you just might feel a little left out is all. CELTA Course Recommendations Coming Soon. You only need a teaching certification if you want to teach English – and even then, it isn’t completely necessary. I was able to get full a full time teaching job in South Korea because I worked as a teaching assistant in England and spent some time volunteer teaching in Uganda. In essence, my teaching experience was equivalent to a teaching qualification and that is why I got a job. Since I left Korea however, things have changed. You can no longer work for a government school without a TEFL / TESOL (minimum 120 hour) qualification and the level of demand for English teachers does not currently match the number of teachers available, making it harder to get a job. Thus, anything that you can do to boost your appeal to employers will have a positive effect. Whilst the level of demand for English teachers in South Korea is waning, there are also many other countries with fast growing markets for English teachers and I have teamed up with a couple of recruiters I trust to help people find jobs teaching English in China, Indonesia, and Russia as well as South Korea – you can apply here. If you are going to try and get a job teaching English without doing a teaching qualification, I highly recommend doing research online about teaching practices and try to get a little bit of classroom experience by volunteering somewhere. Standing up in front of a class for the very first time, not having a clue what to do, can be quite a daunting experience!